I like the sound of this – steak, onion, mushroom and red wine topped with potato, don’t think you can go wrong with that combination. I would suggest though that if you don’t have an ovenproof pan it would be better to transfer the meat to an casserole dish as I don’t think the potato cook all the way through under the grill. 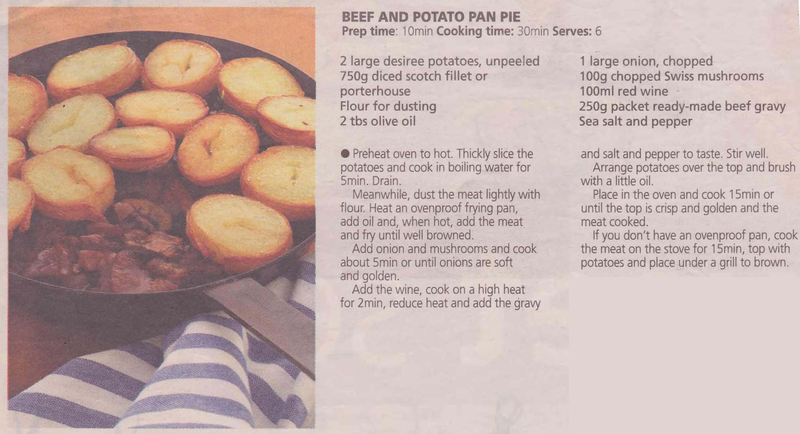 This entry was posted in All Recipes, Beef, Main Dishes and tagged 2000s, beef and potato pan pie, mushroom, onion, potatoes, red wine, steak by bebsrecipes. Bookmark the permalink.